Doritos Blaze and MTN DEW ICE, two new PepsiCo product innovations that recently hit store shelves nationwide, are coming together for a :60 in-game Super Bowl LII advertisement on Feb. 4. 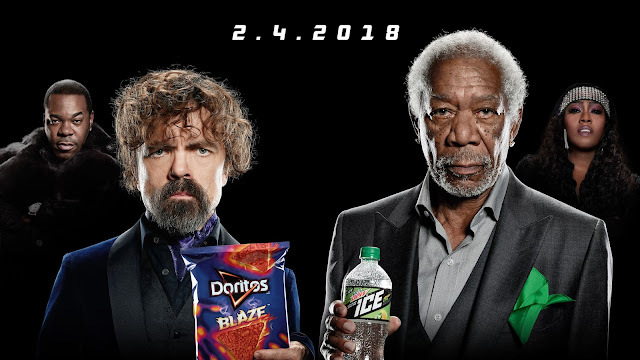 The teaser video (watch here), released today, features award-winning actors Morgan Freeman for MTN DEW ICE and Peter Dinklage for Doritos Blaze intensely facing off. The advertisement marks the first time one company has advertised two of its trademarks back-to-back in one nationally televised Super Bowl commercial. Both brands are back in the Super Bowl – Doritos returning after its successful 10-year run of the "Crash the Super Bowl" campaign that concluded at Super Bowl 50, and MOUNTAIN DEW returning after its wildly popular advertisement "Puppymonkeybaby," also in the 2016 game. "This is a great example of the power of PepsiCo's food and beverage portfolio coming to life for consumers on one of the world's largest stages," said Al Carey, chief executive officer, PepsiCo North America. "Doritos and Mtn Dew go perfectly together, and both brands have passionate fan bases. We think consumers will love Doritos Blaze and MTN DEW ICE, as well as this engaging Super Bowl ad." Doritos Blaze, a bold new flavor that brings the heat, is the brand's next national offering that fires up the hot and spicy snack market, featuring a complex flavor and heat that builds as you crunch. MTN DEW ICE is a clear, refreshing, lemon-lime flavored DEW® with a splash of real juice that will keep DEW Nation charged. As part of the Mountain Dew-versus-Doritos promotion, the brands will run an exclusive Snapchat lens on Super Bowl Sunday where fans can record themselves trying to lip-sync like Dinklage or Freeman.